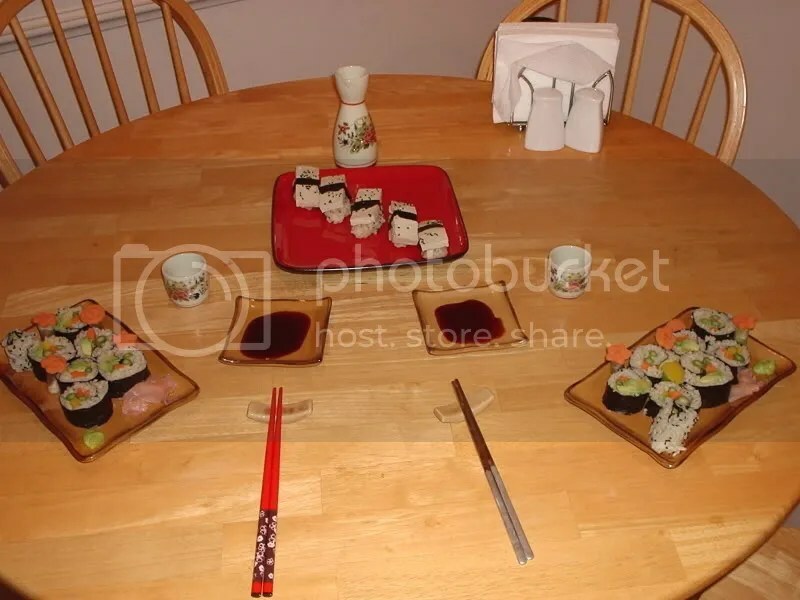 This was a simple sushi bento. On the left we have some avocado sushi and on the right there’s grilled sweet potato sushi with avocado. Yum! 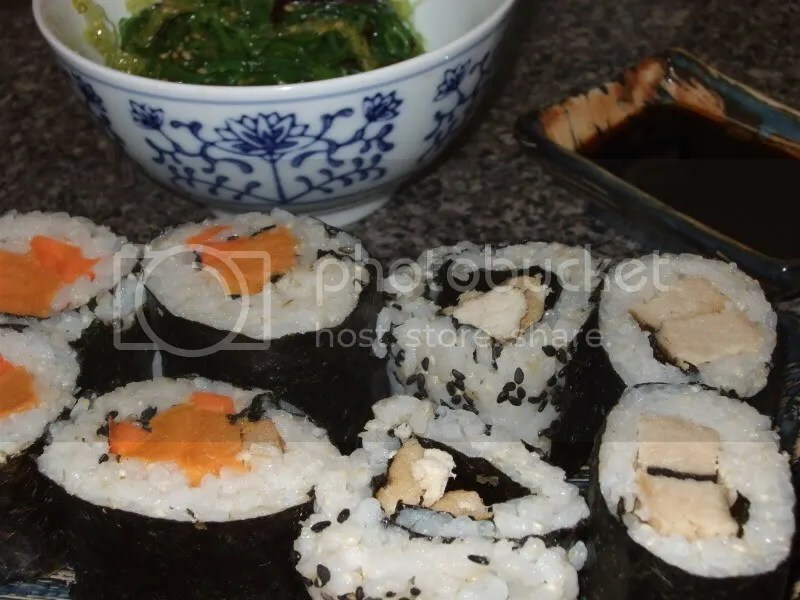 Mock Fish Sushi Rolls and more! A few days ago I went to a huge asian grocery store and found a large area of frozen veggie meats, including fish! I have always enjoyed fish, but after becoming vegan it’s been hard finding substitutes. I got some tuna and ribbon fish there and it’s pretty good. I’ve been in the hankering for sushi so I thought it’d be neat to try to make more “realistic” sushi by cooking the mock fish, then cooling it and adding it to sushi. Overall I think it turned out great! There’s the mock tuna roll, ribbon fish (I rolled it inside out) roll, carrot sweet potato and ribbon fish roll, and carrot and sweet potato roll. They all turned out great and I think I finally mastered making sushi rice! We also had some seaweed salad that I got premade at the asian market. I love seaweed salad! I could eat it everyday. 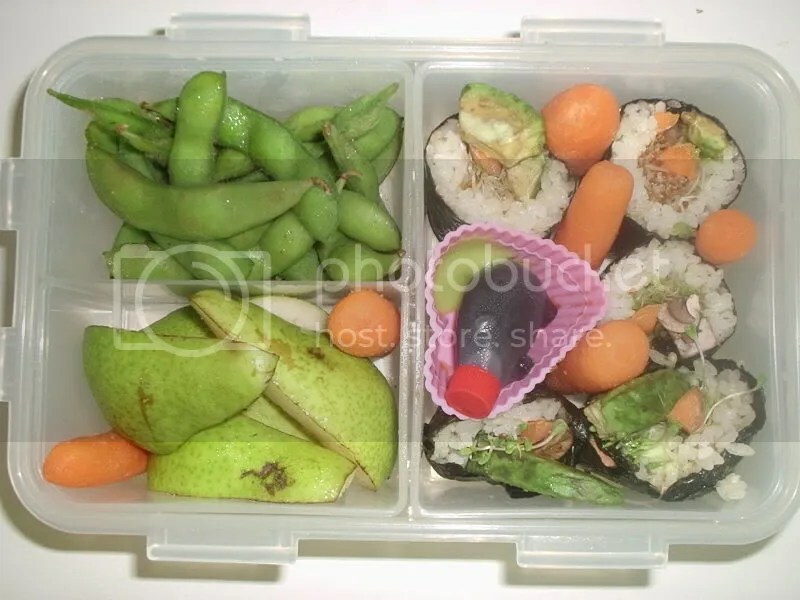 This bento is inspired by green foods. I thought it would be interesting to focus on one color with a few other colors as asides. 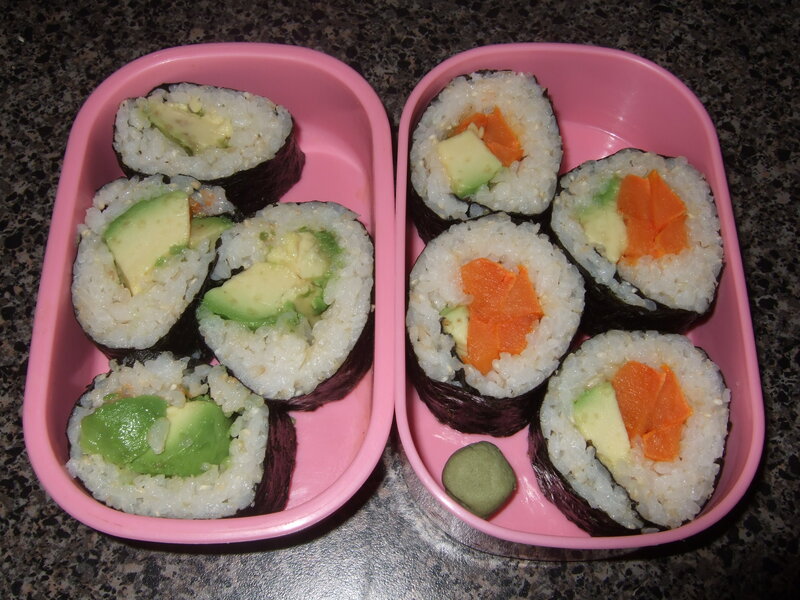 I started out by adding a few leftover veggie sushi rolls with some wasabi and soy sauce. Then I sliced up a pear and added some edamame pods. I had a few spaces left so I added some baby carrots for an extra snack, although they aren’t green! I guess I should have put something else, but I got a huge bag of the baby carrots so I felt it would be best to eat them up. 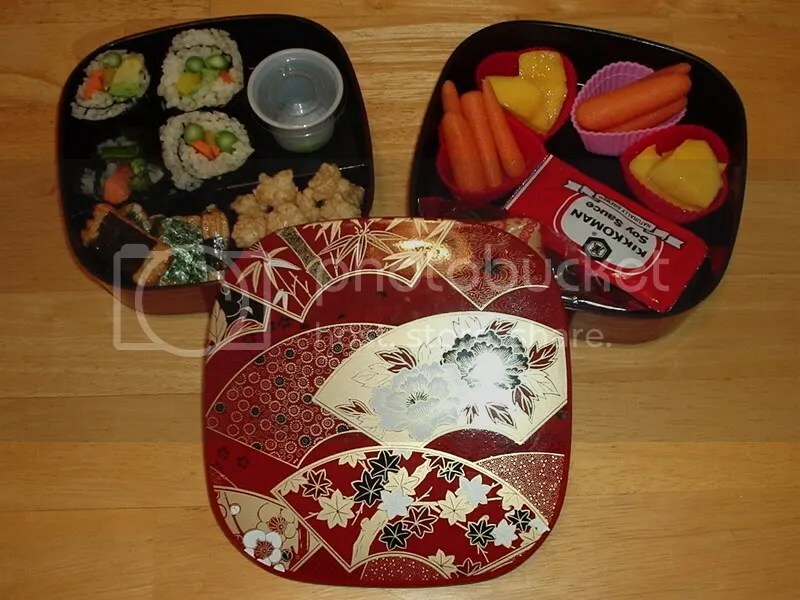 I made this bento last night with some of the sushi leftovers from dinner. I had work today so I had to make one, since I actually needed it this time! I just got finished eating everything and it was yummy. It was a nice little meal that turned out to be pretty filling. 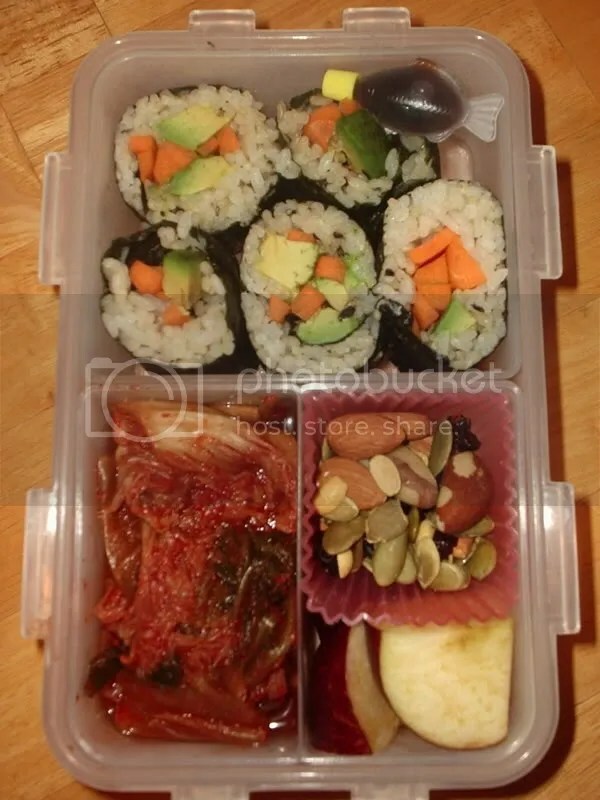 It’s amazing how little the bento boxes are, but how much food you can fit into them. 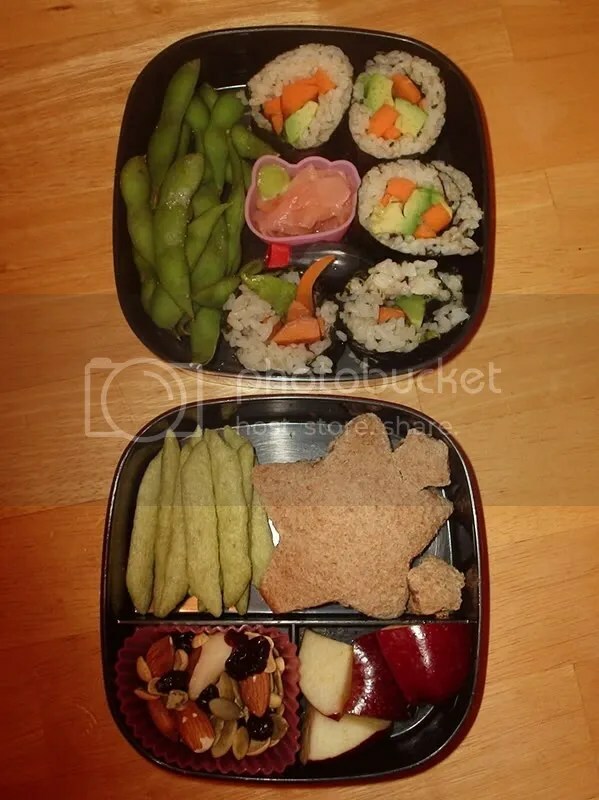 Left: veggie sushi, wasabi (in the little container), nori maki, and soy crisps. Right: baby carrots and mango, a soy sauce packet, and a fortune cookie (it’s kind of hidden).